A collage depicting the Virgin of Guadalupe clad in a floral bikini will stay on display despite protests from some Catholics. 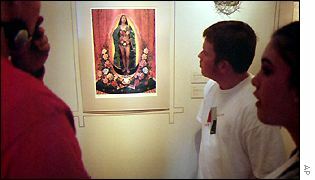 Complaints had been made to the Museum of International Folk Art in Santa Fe, New Mexico, calling the picture offensive. A committee investigated complaints but has ruled Our Lady by Los Angeles artist Alma Lopez can remain. However, to appease protestors the exhibition in which it features will be cut short. The work under fire shows the Virgin Mary wearing a digitally imposed two-piece swimsuit, displaying her midriff. Hundreds of demonstrators turned up at a public meeting in April to vent their anger at the picture, which they deemed sacrilegious. The board of the Museum of New Mexico convened to decide the fate of the portrait. Lopez, herself a catholic, said she had portrayed the Madonna as a strong, independent woman and had not intended to offend. She was pleased with the compromise reached by the board. She said: "I almost see it as the only fair decision for them, to acknowledge that some people in the community were offended, but that the work needed to remain on exhibit." The Cyber Arte: Tradition Meets Technology exhibit, which includes the collage, was due to close in February 2002. Joyce Ice, head of the museum, said it will now close on 28 October, "in the spirit of reconciliation". The museum views their decision as "walking the middle ground" without censoring the art.